Soap and water didn't quite do the trick? Chromium (chrome) is a very soft metal that is commonly used for a wide variety of everyday products such as faucets, pots and pans, bumpers, and even chrome wheels and chrome rims. Because it is so soft, you will never find anything that is made entirely of solid chrome. The chrome on those new rims you’re so proud of is actually an extremely thin layer that was applied through electroplating. I’m not saying that’s bad. It’s just the way it is. Again, chrome is very soft, and if your rims (or pans) were solid chrome, you wouldn’t want them. Besides being extremely stable under high heat (which makes chrome great for mufflers and the like), chrome plating is what gives your metal objects that nice blueish luster we’ve all come to love. The problem is, while chrome is a very durable metal and can last for years, it doesn’t take long for it to get dirty and dull looking. And because you will need to clean chrome frequently, it is important to know how to clean chrome properly. Improper chrome cleaning can lead to accidental chrome removal and some seriously pissed off do-it-yourselfers. If you’re looking to clean your chrome steel safely and without damaging it, no matter what it’s been electroplated to, follow the steps below. Never neglect chrome. The best way to avoid damage to chrome objects is to not allow them to get (very) dirty in the first place. The dirtier chrome gets before you deal with it, the more effort and force you’re going to have to use to clean chrome and the higher your risk of damaging it will become. The moment you start to notice a dulling of the chrome, wash it. Avoid washing chrome pans in greasy water. The grease will leave a film on your chrome pots that will get cooked on and will be very difficult to remove. For chrome wheels, remove them in the winter. Salt is very tough on them. Soap and water. Sounds too good to be true, I know. But oftentimes, if the need to clean chrome isn’t bad, this is all you need. If it’s pots and pans or something else that’s easily submersible, a sink full of water, a good dish detergent, and a soft rag (chrome scratches easily) is all you need. 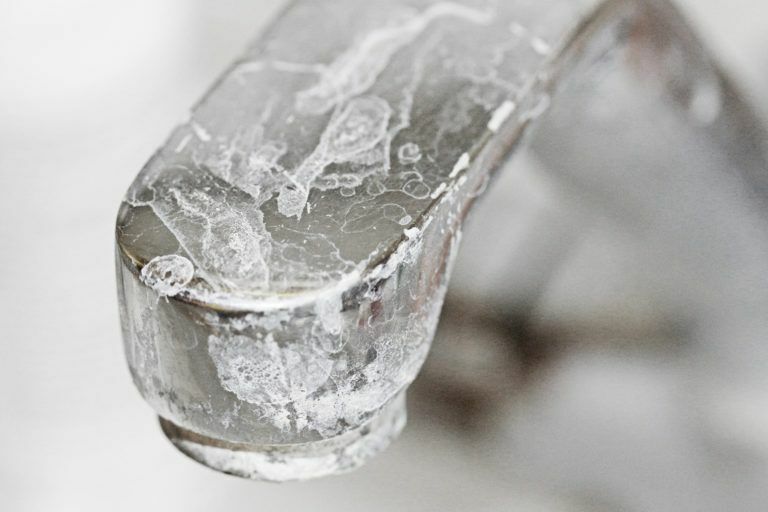 Clean the chrome finish on the handles and faucets of your sink while you’re at it. For grooves and hard-to-reach places, use a soft-bristled toothbrush. Soap and water didn’t quite do the trick? You may need to move on to something a little stronger. Continue to use your soft rag, but this time use vinegar as a chrome cleaner. Because vinegar (either plain white or apple cider) is slightly acidic, it works well for taking tarnish and gunk off of chrome. This can be used to clean chrome rims, chrome pans, chrome bumpers, or whatever else you’ve got. Just remember to use different parts of the rag as you go along so you’re always using a clean section. 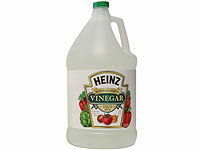 If you need a little extra umph, sprinkle a little baking soda on the vinegar-dampened rag. Clean rusty chrome. If there are little bits of rust peeking through your chrome finish, it works well to grab a bit of aluminum foil, crumple it up, dip it in vinegar (or Coca-Cola), and scrub. Be careful not to apply too much pressure, though. 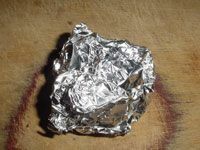 Scrub with medium force and re-dip your foil often. This type of chrome care works well for chrome bumpers, bikes, tailpipes, etc. The Coke does work well, but it will make things a bit sticky. Try vinegar first. Regardless of what you use, after this method of chrome polishing, always rinse well with fresh water. In cases of more severe rust, aluminum foil can be substituted with very fine grade steel wool. All dried up. Once you’re satisfied with the cleanliness of your chrome, make sure you dry it really, really well. Chrome is absolutely notorious for developing water spots. 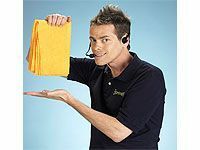 The moment you get done washing chrome, grab a soft, dry towel and go over the entire object with it. While this might not be all that important for folks who want to clean chrome cookware, for those of you who want to clean chrome wheels, bumpers, tanks, etc., you want stuff to look nice. It also works very well to dry chrome with used dryer sheets. Waxing chrome. Now for the last step. After polishing, if you want to keep your chrome looking nicer for longer and reduce the frequency of cleaning, I suggest you get yourself a good chrome wax. Actually, almost any car wax made from carnauba (see below) will do the trick. Just make sure to give whatever you’re waxing a couple coats. The first coat will fill any pores, and the second coat will provide all that nice luster. Buff between coats. You simply do not need commercial chrome cleaners to polish chrome. The methods covered above have been proven over and over to be safe and effective. 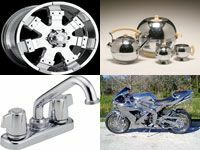 However, if you’re looking for a simpler way to clean chrome wheels or anything else with a chrome finish, there are products available that are easier and faster to use. Not better, and definitely not as environmentally friendly, but faster and easier. 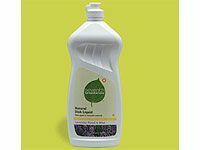 While Mother Earth and I would much rather see you use the above methods, many people swear by commercial chrome cleaners such as Flitz Stainless Steel & Chrome Cleaner, Mothers Chrome Cleaner, Turtle Wax Chrome Polish, and Bar Keepers Friend (very highly regarded). If you feel your chrome may be too far gone for any hope of recovery, it might be advisable for you to just give up and get whatever it is re-plated. It’s quick and easy to find someone to do this for you. Simply type “chrome plating” into a Google search and make a few calls. Mothers Pure Carnauba Wax. 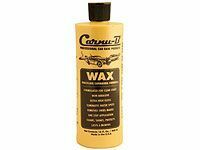 Carnauba wax is a natural wax that is collected from the leaves of the Copernicia cerifera palm tree. This wax is one of the hardest waxes known to man, has a ridiculously high heat threshold, and is commonly used in things like make up, fruit coatings, medicinal tablet coatings, soaps, and dental floss. 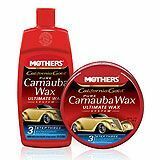 You can order Mothers Carnauba Wax from Amazon. 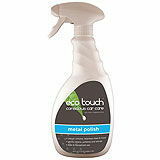 Eco Touch Car Metal and Chrome Polish.This stuff will safely clean, polish, and shine up your chrome, stainless steel, and aluminum. It’s biodegradable and nonabrasive, and it works well for removing oxidation, grease, grime, streaks, and smudges. It is also a highly recommended chrome wheel cleaner. 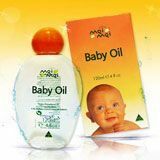 Baby oil. That’s right: it’s not just for baby butts anymore. Just dump a little baby oil on a soft cloth and use it to clean faucets, appliances, vehicles, or any of your other chrome-plated objects that might need cleaning.